Aquastar Cleaning Services prides ourselves on providing white glove service to all of our customers on every visit. However, none of this would be possible without our customers. In fact, while it might be easy for us to imagine that we designed the winning formula all on our own; it all starts with our customers'. That's why we tend to think of the relationship that we have with our customers' as being on the same team. Except, the object of this game is for everyone to work together to make sure that the customers' needs are adequately met. On our end, this means making sure that any time we are on a job that we give the customer our full attention so that we can deliver the level of quality, reliability and professionalism that our customers' come to expect. And just as we have a role to play in this partnership of sorts, so do our customers'. Here are some of the things that our customers' can do to help us serve you better. To ensure that our cleaning personnel is able to clean your home in the event that you are either not at home or are running late for our cleaning appointment, please provide us with a key. There are several ways that you can do this. 1. You could place your key inside of a combination lock and place the lock next to your door. 2. You could hide the key and when you're on the phone scheduling the appointment with us you can tell us where to find the key. 3. You could also give us a copy of your house key prior to one of our cleaning teams coming out. As much as we'd like to be able to offer specific arrival times, the reality is that due to factors that are beyond our control such as traffic congestion, accidents, prior appointments going beyond their scheduled times and etc. offering set arrival times is very difficult to do. This is why we ask that you provide us with a key to your home, prior to the appointment, because this way if we are running later than expected it won't have much of an impact on your plans for the day. We kindly ask that you voice any concerns or questions about the work that was done in your home, by calling our offices directly as opposed to communicating your concerns to our cleaning staff. This will allow you to keep a degree of professional distance between yourself and our staff. And remember it doesn't have to be a major issue for you to call us, please call us with any questions or concerns that you may have whether they be big issues or small ones. 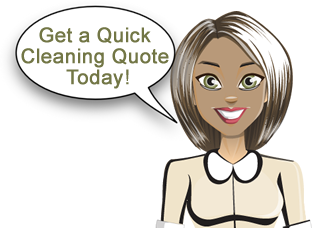 The first time we clean your home, it will take us a longer time to complete the cleaning. So if it's the first time you've ever called us, please keep this in mind. This is because usually the initial cleaning requires us to clean areas that may not have not been thoroughly cleaned before. As part of our commitment to take the hassle out of cleaning we don't require you to sign a contract. However, we do ask that if you need to cancel one of your scheduled appointments that you give us at least 24 hours worth of notice.